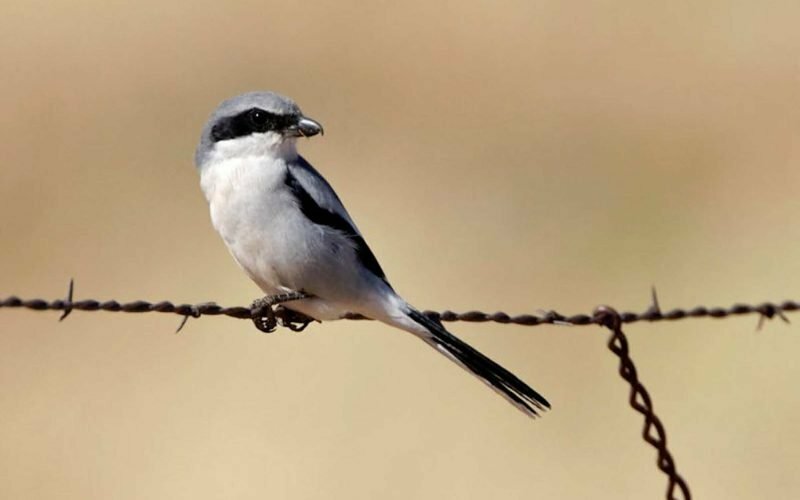 Loggerhead Shrikes make a habit of impaling dead quarry on thorns or barbed wire, the way a butcher hangs meat. The best weapon is sometimes a clever disguise. A Loggerhead Shrike is a bird of prey (like a hawk or an owl) with the size and demeanor of an ordinary songbird. The shrike’s unthreatening appearance and robin-like size means it doesn’t need to hide or lurk as most raptors do. Posing as just another perching bird, this raccoon – masked raptor quietly surveys open landscapes from the vantage of an Ocotillo, telephone wire or fence, then ambushes birds, rodents or large bugs, dispatching victims with a blow from its powerful beak. Here’s something these midget meat-eaters didn’t learn in charm school: Loggerhead Shrikes make a habit of impaling dead quarry on thorns or barbed wire, the way a butcher hangs meat. Loggerhead Shrikes are occasional visitors to Sabino Canyon. The author has seen a shrike perched by Bear Creek road in January, and a nesting shrike in Molino Basin in April. Arizona has a year round population and hosts migrants during cool months as well. From an elevated perch in an open landscape, the Loggerhead Shrike’s keen vision allows it to spot small prey more than 100 feet away. It can either pounce from the lookout or hover and dive. Because a shrike has puny feet like a sparrow rather than talons like a hawk, it transports dinner in its bill. When Loggerhead Shrikes are courting, breeding and building nests they live like the small birds they prey upon. In early spring, shrikes construct thickly woven nests of twigs and grass in thorny shrubs. Females incubate a clutch of four to six eggs. The male feeds the female while she’s sitting on the eggs, bringing her food he’s snagged or has stored skewered on thorns. Eggs hatch after about two weeks. Then, mom and dad must deliver food frantically to satisfy the fast-growing chicks. According to one study, Loggerhead parents must deliver about 15 grasshoppers per hour to their nest full of squawking beaks.